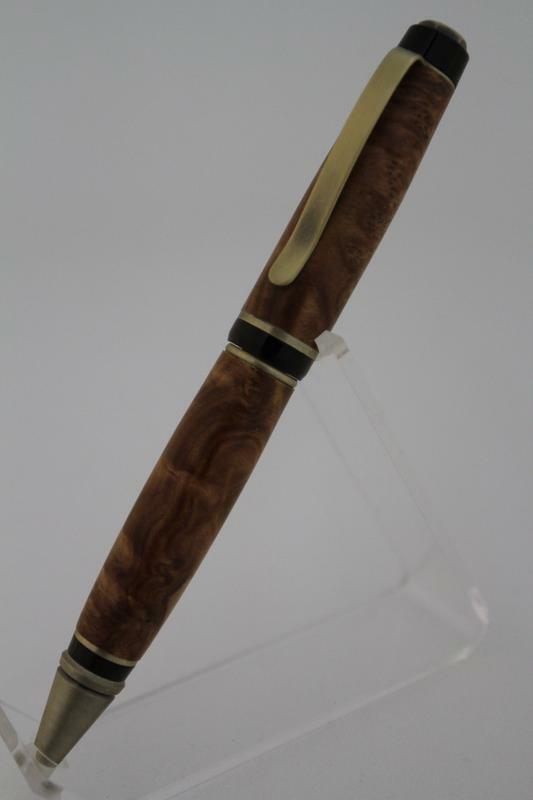 On this page is the result of many hours of work creating many different styles of pens. The number of different types are amazing. Due to requests, we have added fountain pens. They truly are unique. 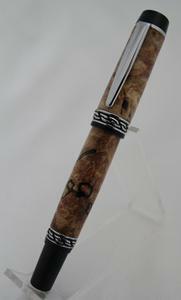 We have several new inlay pens that depict various interests. 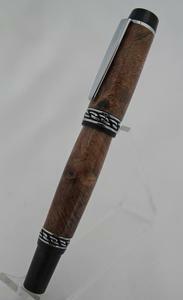 There are many more inlays available. Please CONTACT US if you have a particular interest. Classic slimline pens and letter openers are also available. 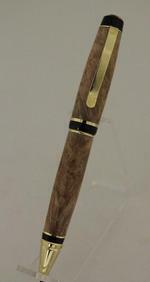 If you see a pen or letter opener on this page but not in the catalog please CONTACT US. These will make great gifts for yourself or that other someone special. On the left is the father sing desk pen with a twist operation with a Cross type refill. The funnel on the platform is gold. The wood is domestic wood walnut. A pacque could be placed on the platform for that special person. 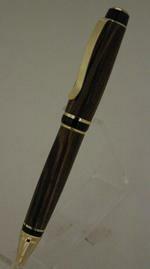 The next picture is of a father sing which features a double-taper of the exotic wood Zebrawood. The next two pens are the classica design that features gun metal and 24k gold with twist action for the Parker style refill. 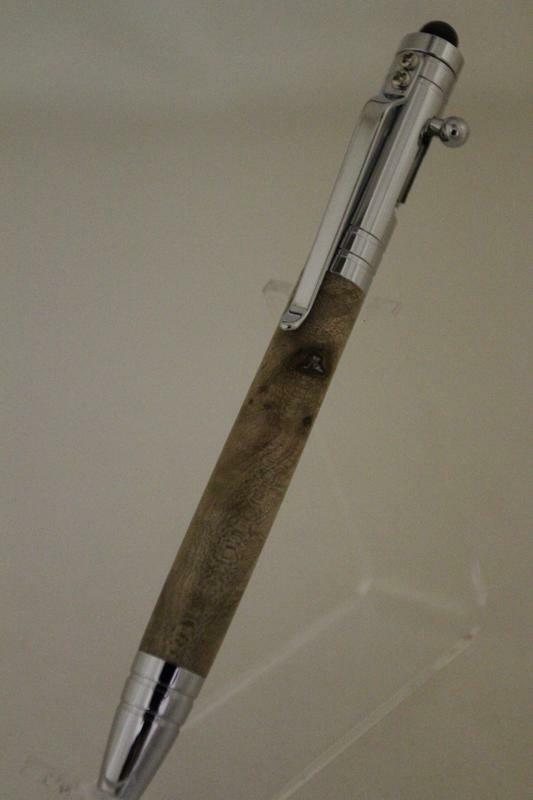 The wood is certified Olive wood, the grain is amazing! 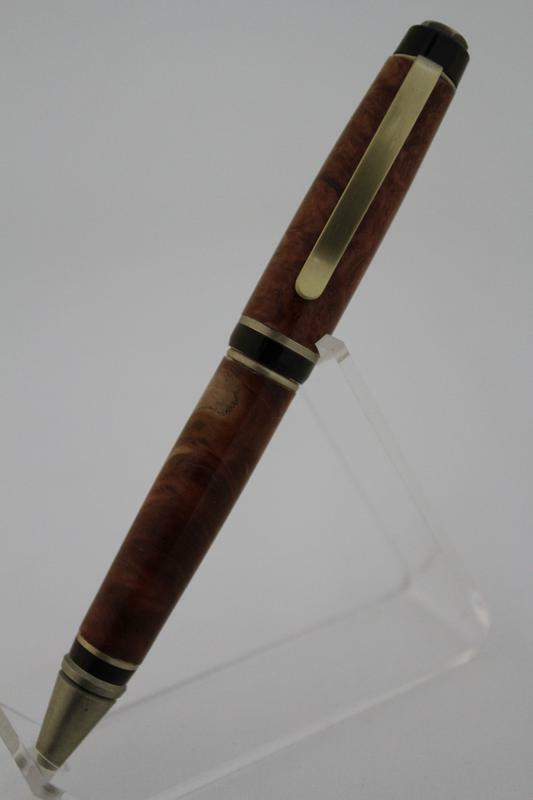 The next two are clicker pens with Parker type refill. The wood on the left is buckeye burl which is amazing as it is turned, the next one is blue and white acrylic. The metal is black titanium. The top picture shows the slimline pens beside letter openers that would make a beautiful set as an excellent gift. The metal is 24k gold and rhodium. They contain Cross type refills. 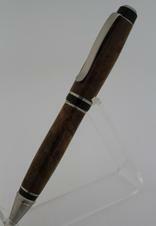 The beautiful woods are exotic wood: Cocobolo, Zebra wood, diagonal cut Bocote, Zebra wood and Purpleheart. The third from the left is domestic wood walnut. 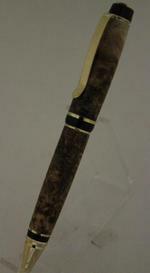 The letter openers have 24 k gold dual sided blade. The 3 center letter openers are 10k gold, the far left and far right are 24k gold plated. The wood has been turned from exotic woods: Bloodwood, Purpleheart, Panga Panga and Zebra wood. The domestic wood: walnut far right. The shape of each accents the grain of the wood. The six pens on the left are Chicago ballpoint pens with twist action for the Cross type mini ballpoint refill, with a black enamel cap. The metals are 24k god and chrome. The bodies are on the left blue maple burl, center are red acrylic, right are dyed wood cut on an angle before turning. 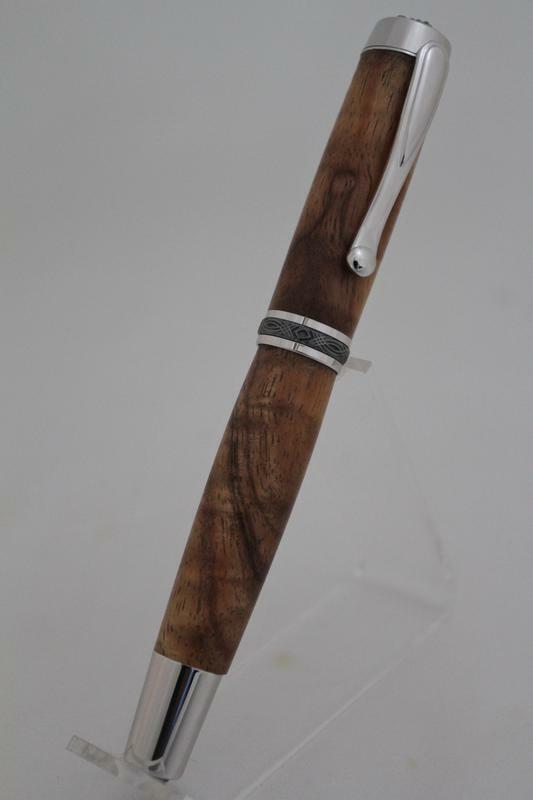 The three middle pens are the elegant beauty style, the metal is satin chrome featuring an interesting center ring.They have twist action for the Parker refill. 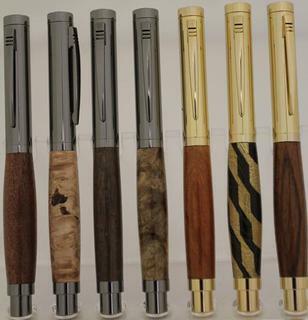 The bodies are left to right: diagonal cut Bocote, green and white poly, and rainbow dyed wood cut on an angle.The last four pens are heftier more masculine-looking cigar pens that combine two-tone gold and black accents and hexagonal end cap. They accept Parker type refills for a twist action. The bodies from left to right are: red and blue acrylic, clear buckeye burl, green buckeye burl and diagonal cut Bocote. These 4 pens are of the Sienna style pen. 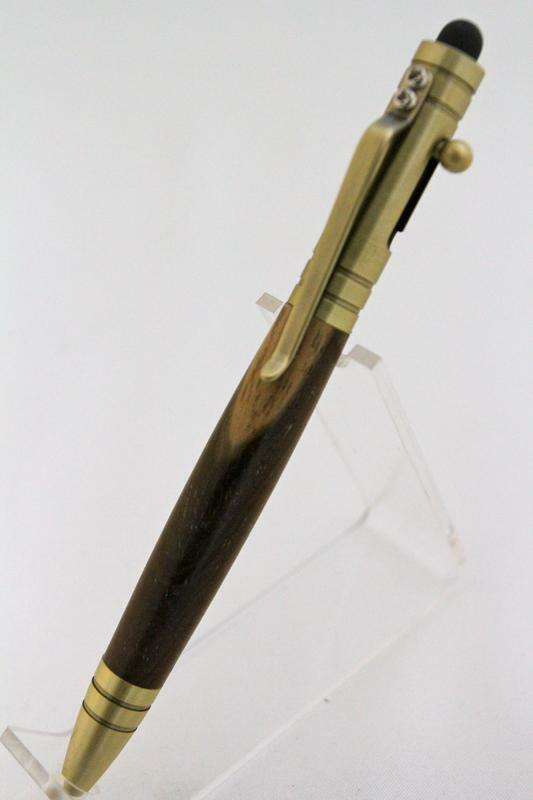 They have a twist action and Parker type refill. The finishes left to rt are: Black Titanium, Gold, Chrome and 10k Gold.The 2 on left are the Bald Eagle surrounded by blue. 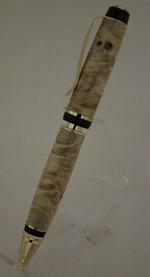 The Betsy Ross flag has 28 pieces of wood in the wood body!. The 35-Star Flag has 49 pieces of wood in the body!! 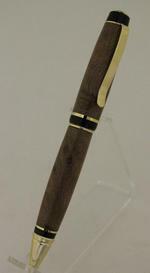 Fountain pens of different styles and woods.The nibs are all German-made two-tone with genuine iridium point. They will accept standard ink cartridges as well as ink reservoirs. They are all non-postable, except the Guardian pen. 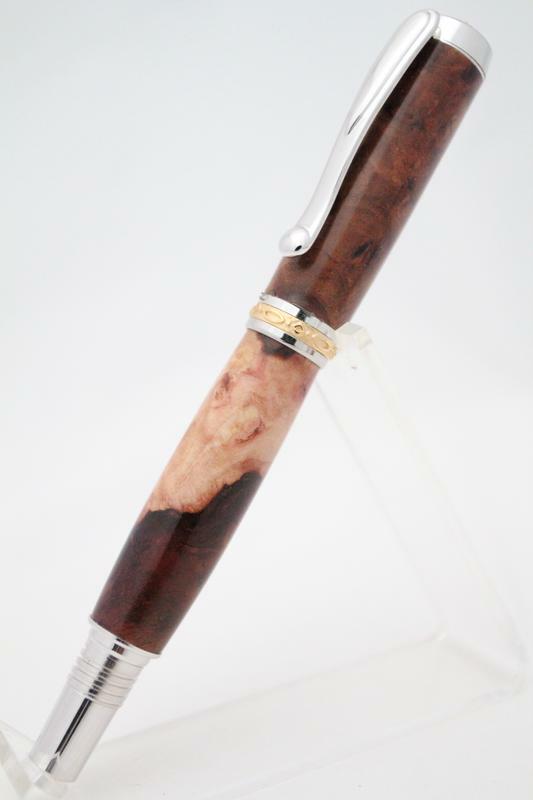 1st on the left is Rhodium/22k Gold Jr. Statesman with Redwood Burl. It is 5"L x .5" dia. 2nd is Rhodium Gentleman's pen with Box Elder dyed red and black. It is 5.5"L x .75" dia. 3rd is Rhodium/Black Titanium Statesman with Yellowheart & Walnut.It is 5.75"L x .5" dia. 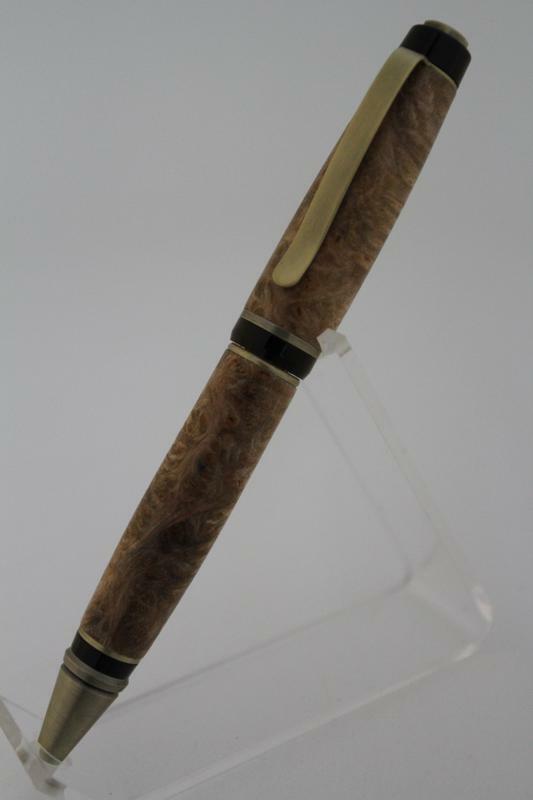 4th is Titanium OLympian ll Elite with Buckeye Burl. It ia 5.25"L x .5" dia. 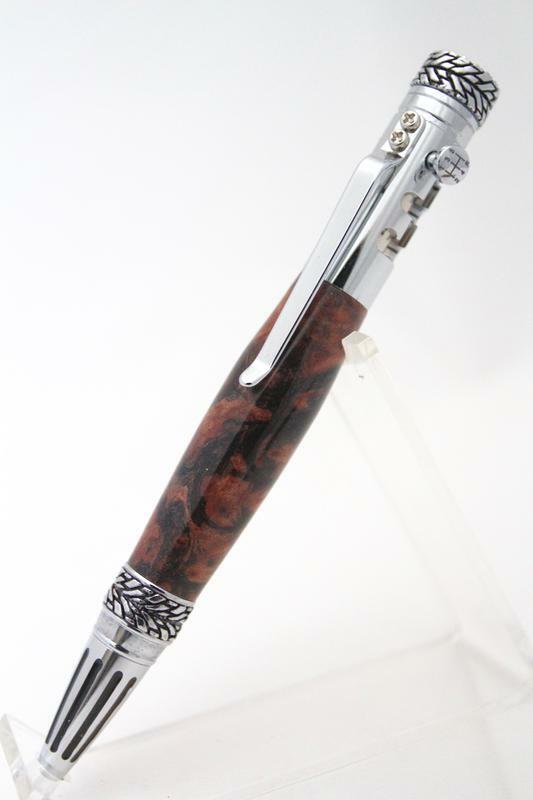 5th is Rhodium/Black Titanium Statesman with Redwood Burl. It is 5.75"L x .5" dia. 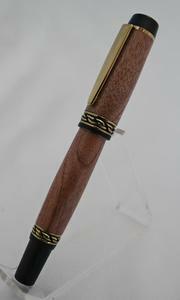 6th is 24kt Gold Titanium Guardian postable with Box Elder. It is 5.25"L x .5" dia. 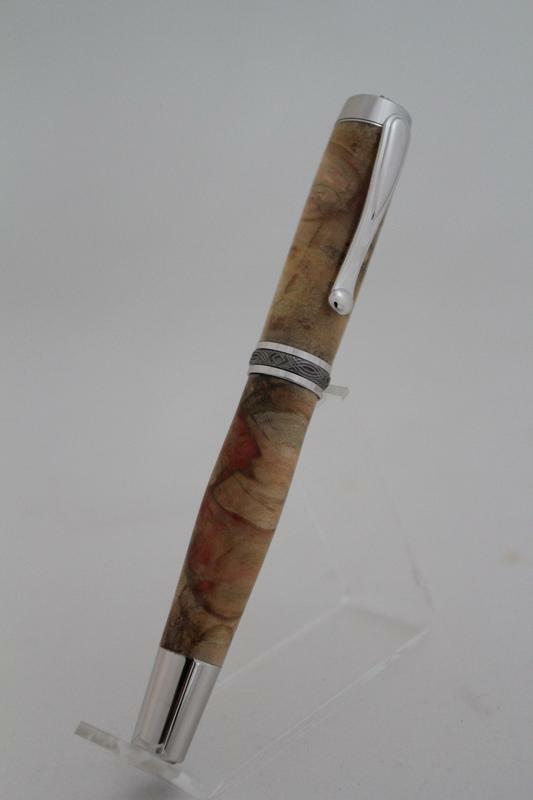 7th is Gold Titanium Apollo Infinity with Redwood Burl. It is 5.5"L x .5" dia. 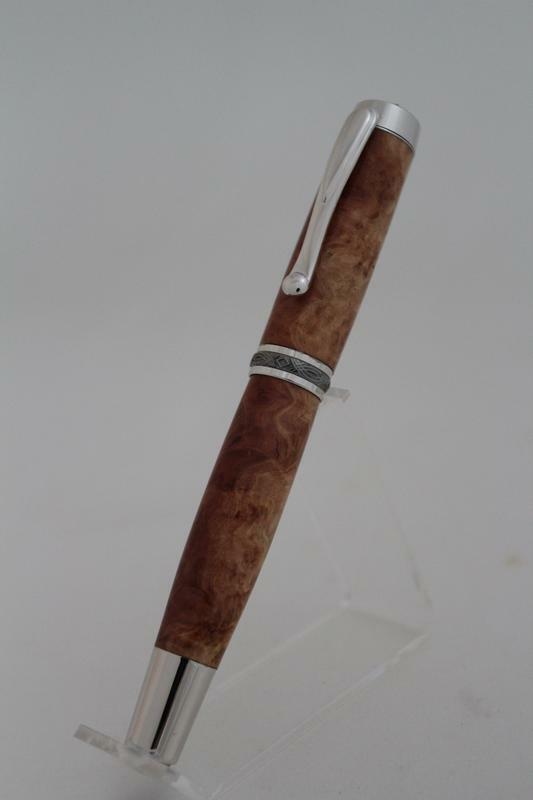 8th is Rhodium Gentleman's pen with Buckeye Burl. It is 5.5"L x .75:" dia. 9th Rhodium/Black Jr. Statesman ll with Curly Poplar dyed orange. It is 5'L x .5" dia. 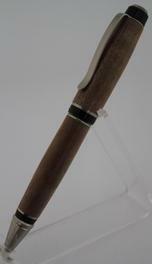 All fountain pens are $75.00 each. 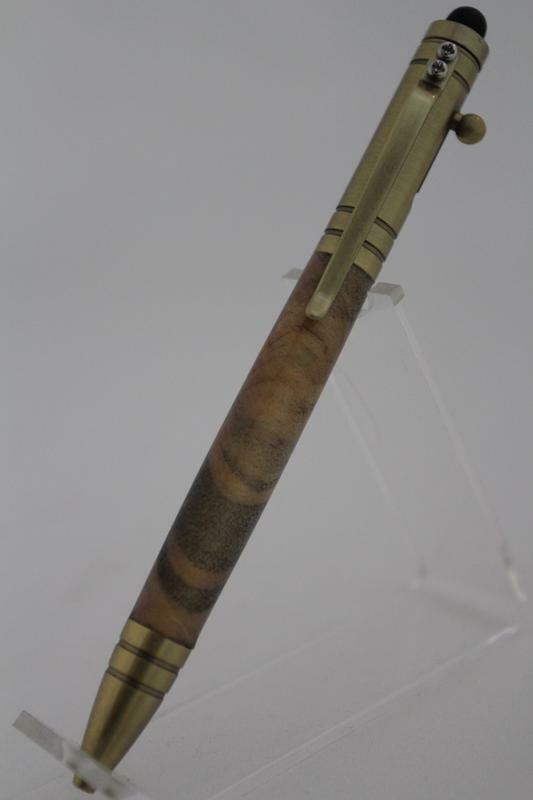 10th Gold ElGrande with Buckeye Burl. It is 5.25"L x .5" dia. 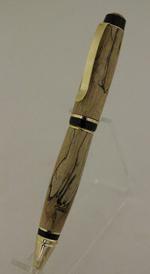 11th is Gold ElGrande with Olive wood. It is 5.25"L x .5" dia. 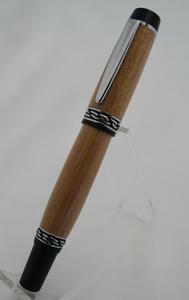 These 2 rollerball pens are $ 65.00 each. 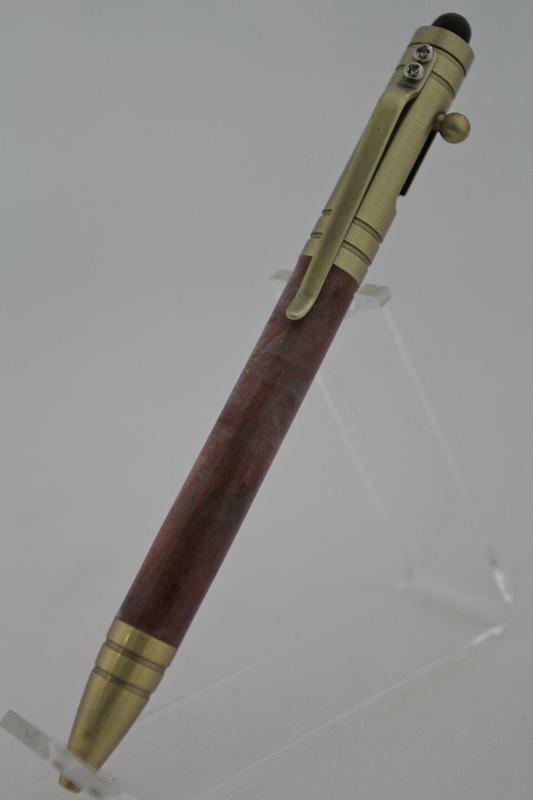 1st on the left is 24k Gold Manhattan Click pen with Box Elder dyed red. 5.5"L x .5"dia. 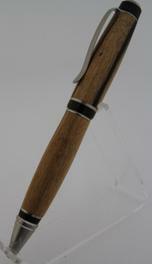 2nd is Gun Metal Manhattan Click pen with exotc Olive Wood. 5.5"L x .5"dia. 3rd is Gun Metal Manhattan Rollerball pen with Buckeye Burl.5.25"L x .5"dia. 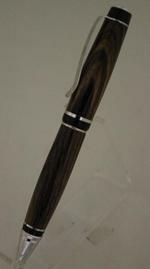 4th is Gun Metal Manhattan Rollerball pen with exotic Kingwood. 5.25"L x .5"dia. 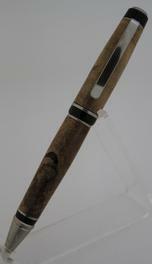 5th is Black Titanium European pen with exotic Spalted Tamarind. 5.5"L x .5"dia. 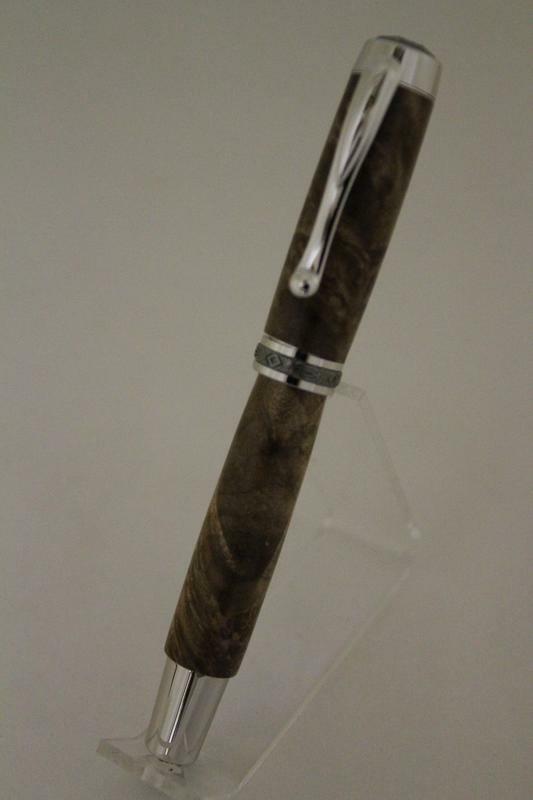 6th is Rhodium European pen with Big Leaf Maple. 5.5"L x .5"dia. 7th is Satin NIckel European pen with exotic Canary Wood. 5.5"L x .5"dia. 8th is Satin Nickel European pen with exotic Panga Panga Wood. 5.5"L x .5"dia. All pens use a cross refill except thte rollerball which are Schmidt rollerball. 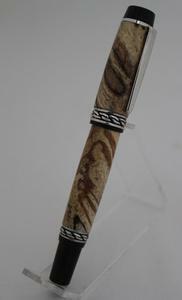 These pens are $40.00 each. 1st on left is a 50 Star Flag pen with the gold Sienna Vista style pen. 2nd is the 35-Star Flag with the Gold & Black Wall Street ll style pen. 3rd is 50 Star Flag pen with Chrome Sienna Vista style pen. 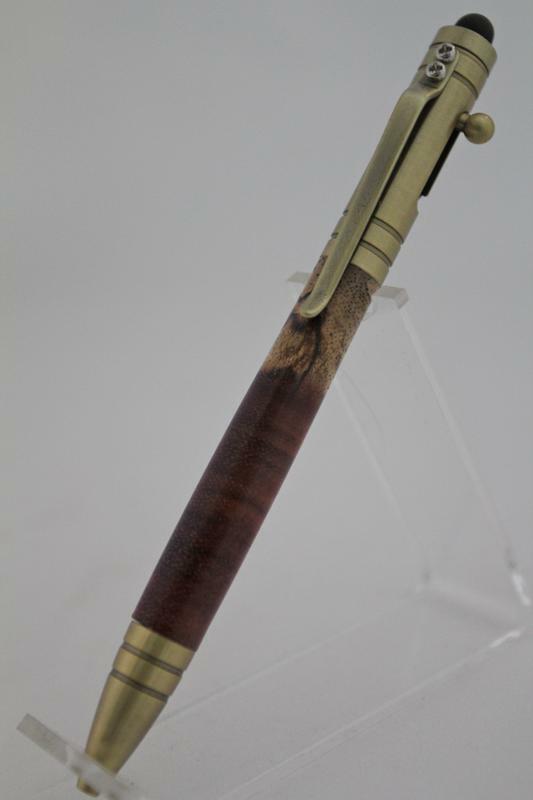 4th is Bald Eagle surrounded with brown wood with the Gold Sienna Vista style pen. 5th and 6th are the Besty Ross Flag with the Chrome Sienna Vista style pen. All these pens have a real circuit board under clear acrylic. 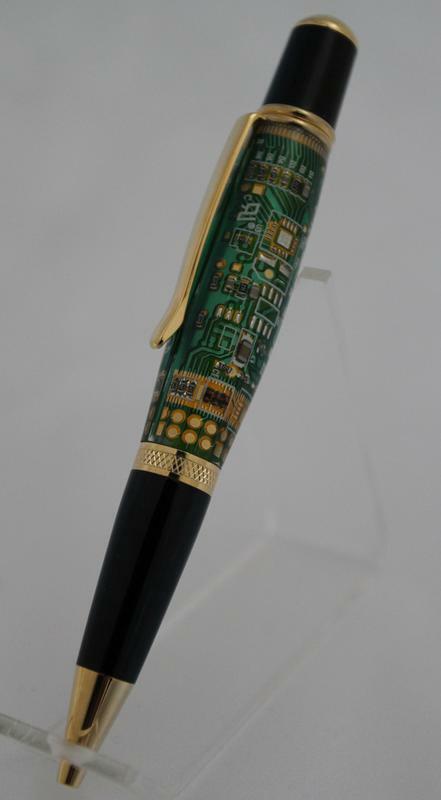 The difference is the color of the circuit board and the finish on the pen. They are all the Wall Street lll style pen. They contain a Parker refill. The 2 on the left have a chrome finish, the rest are 24k Gold with black. The 3rd from the left is a white circuit board, 4th is a black circuit board. The others are green circuit boards. They all are 5.25"L x .5" dia. 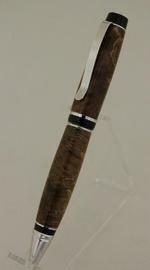 These pens are $50.00 each. These are pen and pencil sets. They use Cross ink refills and Schmidt .7mm pencil mechanism. 1st on left is Chrome slimline style with exotic Panga Panga. 2nd is Chrome Trimline style pen with exotic Cocobolo. 3rd is gold Slimline Style pen with Spalted Maple Burl. 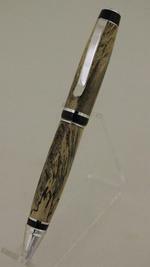 4th is Satin Nickel Vertex style pen with Spalted Tiger Oak. 5th is Gun Metal Trimline style pen with Zebra Wood. 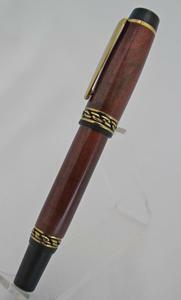 6th is gold Slimline style pen with exotic Honduras Redheart. These sets vary in price. 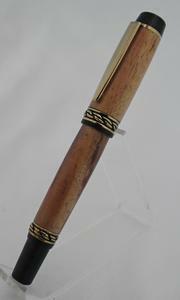 The pens with stylus on the left are of the Sierra Vista with gold and black finish. 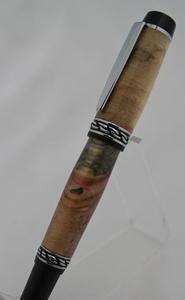 The wood of the 1st is Canary wood, the 2nd is Box Elder dyed blue & pink. They are $45.00 each. 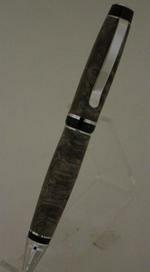 The 3rd & 4th are the Soft Touch Stylus with Gun Metal finish.The 3rd is Cocoblo an exotic wood and the 4th is Citrus Diag. Layered Wood. They are $35.00 each. The next 2 are Soft Touch Bobble Stylus (used with a smart phone or pad), The 5th is Buckeye Burl, the next is Box Elder Burl. They are $15.00 each. 8th & 9th are the European Soft Touch Stylus Pen with Gun Metal finish. 8th is Walnut, 9th exotic Desert Ironwood. They are $45.00 each. The 2 pens on the left are the Wall street ll Black Titanium with Gold. The 1st is Green & White Marble acrylic, 2nd is Citrus Diag. Layered wood. These are $35.00 each. 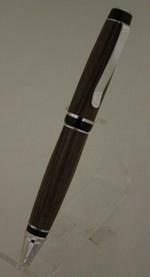 3rd & 4th are the Sienna Click Pencil style. The 3rd is Big Leaf Maple Burl, 4th is Buckeye Burl. These are $40.00 each. 5th & 6th is Elegant Beauty style with Chrome and Satin. 5th is Spectrum Diag. 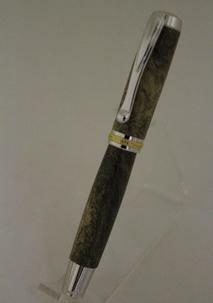 Layered Wood, 6th is Green & White Marble acrylic. These are $35.00 each. These are cigar style pens. They are a little bigger and have more "heft" to them. 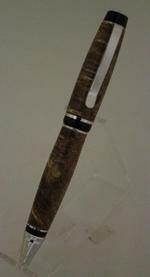 The three on the left have a Black Titanium finish, the woods are: Black Palm(exotic), Cherry Burl, Buckeye Burl. The next three have 10k Gold finish. The woods are: Cocobolo, Amboyna Burl, & Burmese Blackwood, all exotic woods. The last three have a Rhodium finish which is difficult to obtain. The woods are Buckeye Burl, Zebrawood(diag. 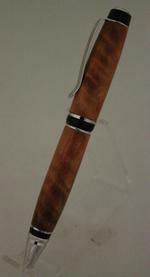 cut), and Yucatan Rosewood(exotic). Each of the pens vary slightly in width to add interest to the pen, accenting the wood grain. They are approx .5" x 5.5"L. They are $45.00. These are Manhattan style pens. They have a Schmidt rollerball refill. The four pens on the left have a gun metal finish. The last three have a 24k gold finish. The woods left to right are: Sapeie(exotic), Big Leaf Maple Burl, Walnut, Amboyna Burl, Amboyna (exotic), Pau Amarello(exotic) & Walnut, and Yucatan Rosewood(exotic). The shape of each pen is slightly different, adding interest to the pens. They all are $40.00 each. These pens represent various interests and make great gifts for people with those interests!! They have a Parker refill. The far left is a snowboarder in a Wall St. ll Black Titanium style pen. 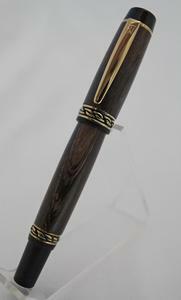 Next is a skier in a Wall St. ll Black Titanium with Gold style pen. 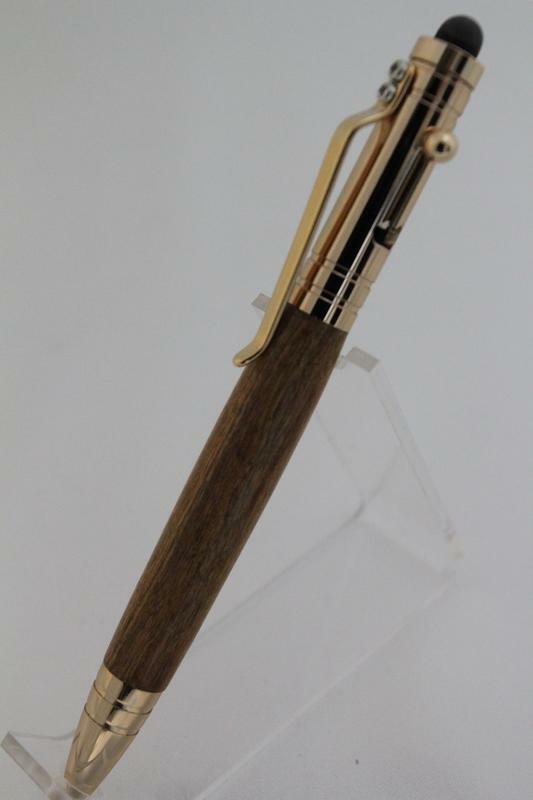 Center stage are the Classica click style pen with a guitar and the Wall St. ll Gold style pen with a guitar. It has very fine pieces that are placed individually to make the pen. 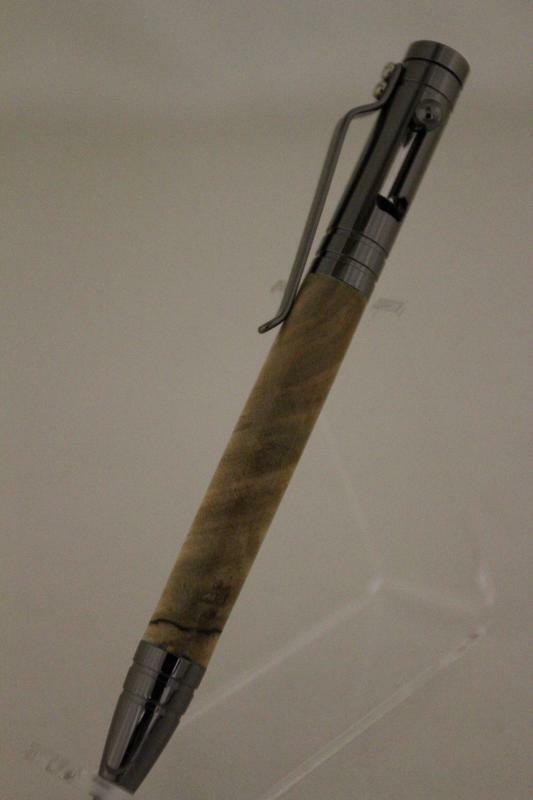 Next is the large mouth bass in a Classica style with a gun metal finish. Next to it is the Classica style 24k Gold finsh pen with a Bald Eagle with a Flag. The last four are for the wine enthusiast!!!! 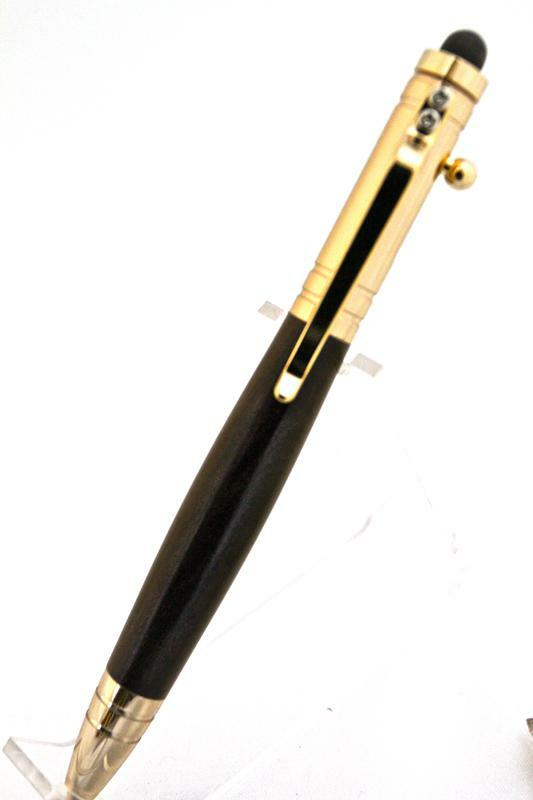 They are in the Classica click pens with the chrome on the left and gold next to it, then the Wall St. ll style pen with the Black Titanium with Gold and Black Titanium with Platinum respectively. These are $70.00 each. For the holidays these pens will look great in your hand !!!!!! The ones on the far left are the Pumpkin with witch hat. The 1st is the Classica style pen with black enamel finish. Next is the Wall St.ll style with black and chrome finish, next is the Wall St.ll Copper finish,2 Wall St ll Satin finish all with the pumpkin with the black hat. Next are Copper finish Wall St. ll and Sienna with Black Titanium finish with the 2 pumpkins . Center stage are the Snowmen!!!!! The first style pen is Wall St. ll with Black Titanium finish,next is Wall St. ll Satin Black/Black Chrome,then Sienna with Black Titanium finish,followed by Wall St. lll with Black Titanium finish with gold. On the far right the reindeer have arrived. These two styles are: Classica with gun metal finish and Gatsby with Gold Titanium. All these are $70.00 each. These are pen and pencil sets. The four sets on the left are gun metal Slimline style. The wood is Cocobolo. As you can see the grain is different in each pen and pencil. The far right is diagonal cut Zebra Wood in the gun metal Slimline style. The sets are $40.00/ set. The pens above are the Cigar Style, which provide a little more "heft" and length when holding the pen. They feature a twist mechanism ann a Parker type refill with premium Swiss made carbide writing tip. As with all woods the grain makes each unique and one of a kind. 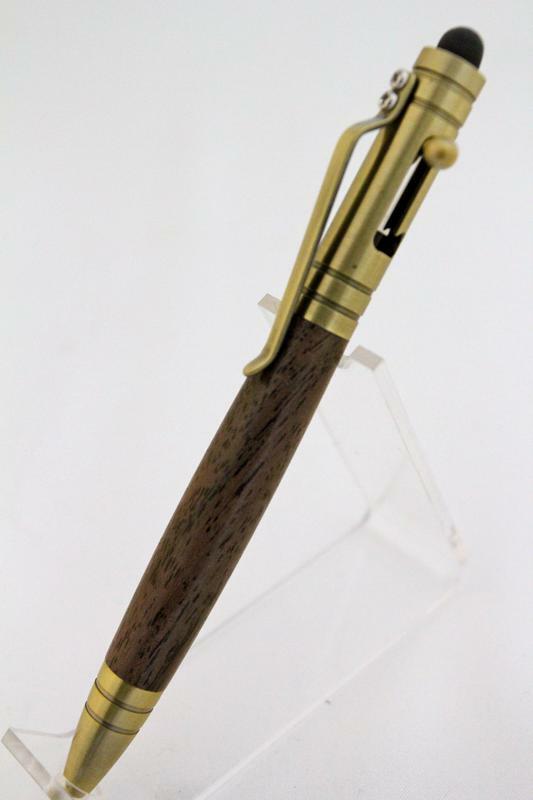 As you can see above pens made of the same wood still have a different look due to the grain and slightly different shaping when being turned. They are approx. .5"dia x 5.5"L. They are $55.00 each. The Fountain Pens above are different styles. 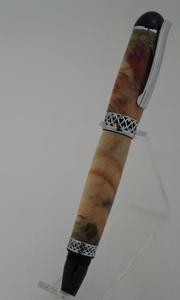 However, they all have a German-made two-tone nib with iridium point. They will accept standard ink cartridges as well as ink reservoirs. 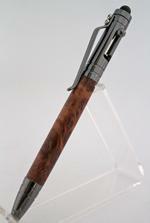 The Statesmen pens (jr.as well as reg.) 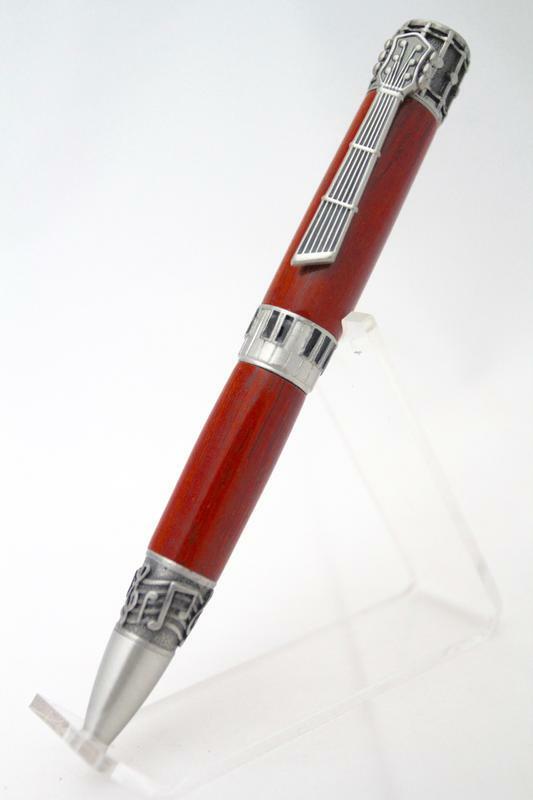 have hand-cast engraved insets on the cap and barrel ends surrounded by Rhodium plating. The cap and band of the Jr. Gentleman's pen has a smoother appearance. The first three pens from the left are not designed for use with the cap attached to the pen (non-postable). The far right is designed to have the cap attached when in use (postable). The Statesman is approx. .5"dia x 5.75"L. The Statesman Jr. is approx. .5"dia x 4.75"L. The Jr. Gentlemans ll is approx. .5"dia x 5.25'L. They are $75.00 each. 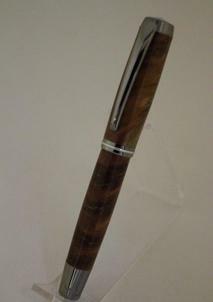 The seven pens above are the Polaris style twist pen. 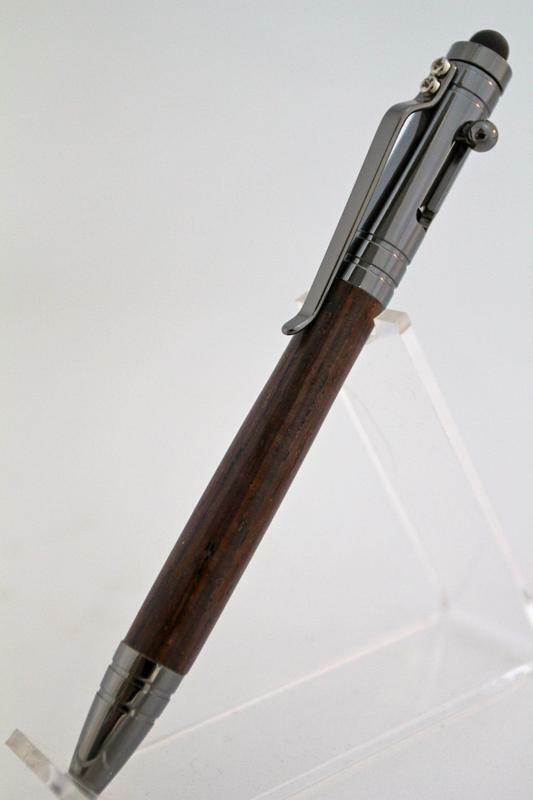 The barrel has a heft that makes it popular. It is well balanced making writing a pleasure. The different finishes give each one a distinct look. 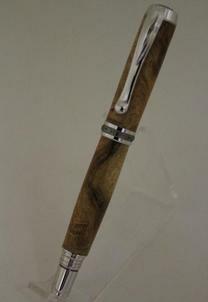 The different woods also make each one very distinctive, a pleasure to look at and write with. They would make a perfect gift. They are approx. .5"dia x 4.75"L. They are $40.00 each. All the above pens are the new Bolt Action Tec-Pens. The reliable bolt-action mechanism smoothly advances and retracts the Parker style refill consistently. The clip is attached to the body with two small screws. 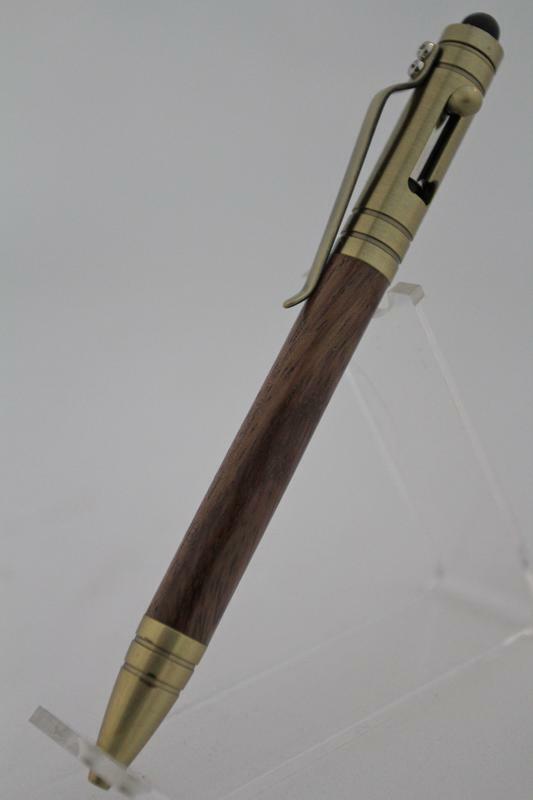 EACH pen includes an end cap and stylus providing for individual styles. Again the woods are what make each pen so individual!! The grains are truly beautiful. They are approx. 7/16"dia x 5.25"L. They are $40.00 each. All the pens below are the new Bolt Action Tec-Pens. The reliable bolt-action mechanism smoothly advances and retracts the Parker style refill consistently. The clip is attached to the body with two small screws. EACH pen includes an end cap and stylus providing for individual styles. Again the woods are what make each pen so individual!! The grains are truly beautiful. 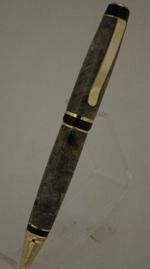 They have the following finishes: 24k Gold, Chrome, Gun Metal and Antique Brass. They are approx. 7/16"dia x 5.25"L. They are $40.00 each. The Fountain Pens above are the Olympian Elite 2 pens. They have a twisted rope 3-D band for a decorative look. 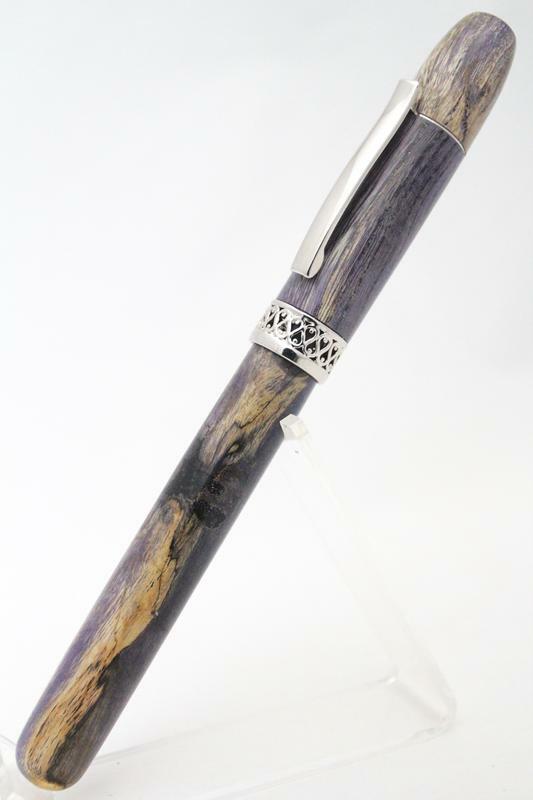 They include a premium German iridium nib and a premium reservoir pump and cartridge.The woods used for turning the body of the pen are indicated under each pen. They are $75.00 each. The Fountain Pens above are the Apollo Infinity style. 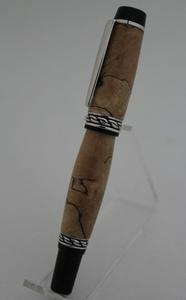 The "infinity" band is 3-D to add interest to the pen. The wood it is turned from is listed under it as well as the finish. It is $75.00. The Fountain Pens above are different styles. However, they all have a German-made two-tone nib with iridium point. They will accept standard ink cartridges as well as ink reservoirs. The Statesmen Jr. pens have hand-cast engraved insets on the cap and barrel ends surrounded by Rhodium plating. The cap and band of the Jr. 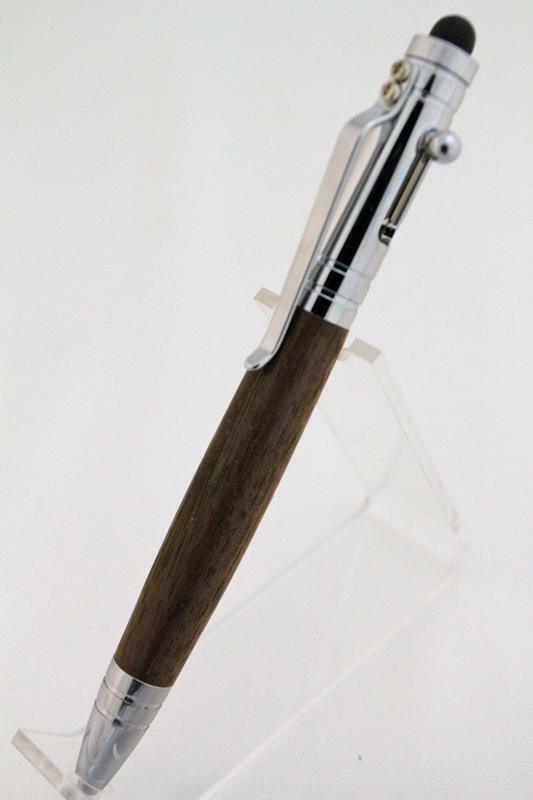 Gentleman's pen has a smoother appearance. All the pens above are designed for use with the cap attached to the pen (postable). The Statesman Jr. is approx. .5"dia x 4.75"L. The Jr. Gentlemans ll is approx. .5"dia x 5.25'L. They are $75.00 each. The Rollerball Pens above are the Olympian Elite 2 pens. They have a twisted rope 3-D band for a decorative look. They include a Schmidt Rollerball refill. 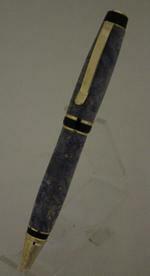 The woods used for turning the body of the pen are indicated under each pen. They are $65.00 each. 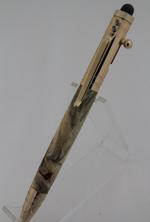 Above are the Wall Street III style pens with a real circuit board encapsulated in clear acrylic. They take a Parker Gel refill. They are $50.00 each.